crew. And now she’s agreed to write this post after just returning from a launch in Baikinor. I’m so excited to share this with you – enjoy! 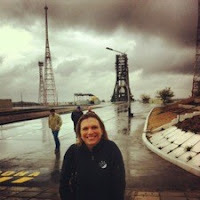 Visiting the Baikonur Cosmodrome was a dream come true for this space geek. I mean, come on, this place is filled with so much history, it’s ridiculous. Many of the earliest achievements in space exploration happened here. From the launch of Sputnik 1 (the first artificial satellite) in 1957 to the launches of the first human (Yuri Gagarin) and first woman (Valentina Tereshkova) into space in 1961 and 1963, respectively. This record of significant accomplishments has continued with the launch of the first piece of the ISS in 1998 and the launch of all Russian crewed missions to date. My journey to Baikonur starts on, literally, the other side of the world (yes, it’s a 13 hour time difference between my house and Baikonur!). Getting to Baikonur from the West Coast of the U.S. is quite a trip. It’s about 15 hours of flight time to Moscow, followed by another 3.5 – 4 hour flight into the Krainy airport in Baikonur. Looking out the window as we were landing, I was struck by the flatness and dryness of the landscape. Upon deplaning from the rear stairwell of the Yak-42 aircraft, I got my first dose of the (in)famous Baikonur wind – it rarely let up during my four-day trip. 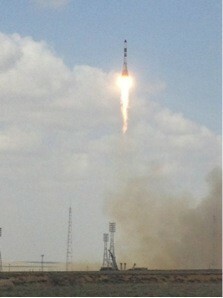 My plane landed just in time for the Soyuz launch of the Progress 51 ISS resupply mission. It was about an hour drive from the airport to the launch viewing area over a bumpy road and through multiple security checkpoints. The launch viewing area is about 2 km (approx. 1.2 miles) away from the launch pad. Having witnessed launches from Cape Canaveral from about 5 miles (approx. 8 km) away, this felt VERY CLOSE! 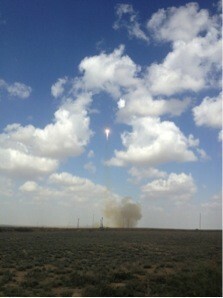 I got there with about 20 minutes to spare and stood out among the scrub brush waiting for the launch. The first sign that a launch is eminent is the support trusses swinging away from the rocket (this is visible with the naked eye from where we observed). Then, a fireball appears beneath the rocket and slowly the rocket starts to accelerate away from the ground, accumulating more and more speed. The best part, in my opinion, is when the sound wave hits you and you and feel it resonate throughout your body. It makes me wonder how it would feel to be aboard the rocket (maybe someday…). Because Baikonur is a controlled-access facility, I was escorted around at all times. 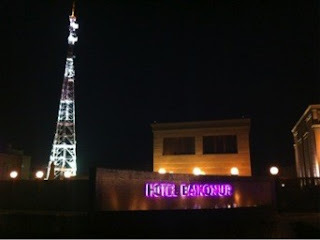 I stayed at the Baikonur hotel, which is a relatively new facility and is very nice! It’s next door to the older Sputnik hotel. Just across the street from my hotel was the “Cosmonaut Hotel” (where the cosmonauts/astronauts stay prior to launch). But they don’t let just anyone in there – there is a guarded gate. Fortunately, I ended up getting clearance to check it out! Behind the hotel building are some recreational areas complete with pool, tennis courts, and even a log cabin. 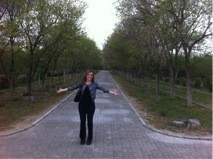 The walking paths (the “avenue of the cosmonauts”) are lined with trees planted by the cosmonauts and astronauts that have launched from Baikonur. This tree-lined walkway was one of the most awe-inspiring living monuments to the human space program that I have ever seen. The path starts with Yuri Gagarin’s tree, which is now quite large at over 50 years old! Each tree has a plaque in front of it with the cosmo-/astro-naut’s name, their country, and the year of their launch. It’s all in Russian, so learn the alphabet before you go if you want to try and read the names. The Baikonur Cosmodrome museum is, in a word, awesome. It’s an incredible collection of space-related artifacts. According to my guide, the traditional way to start the tour is by shaking the mannequin cosmonaut’s hand – who was I to argue with tradition? spacesuit, to a wall with photos of all the cosmonauts/astronauts who have launched from Baikonur. There are model rockets, displays including the first computers used at Baikonur and even a 3D map of the cosmodrome with a model of Sputnik 1 suspended overhead. One of my favorite parts of the museum was the display of memorabilia from each of the crewed missions launched from Baikonur. Each display included mission patches, crew photos and other memorabilia donated by the crew. There was also a poster-sized photo of a Soyuz rocket launch that was signed by recent astronauts and cosmonauts to launch to the ISS from Baikonur. I even found the signatures of some of the current astronauts aboard the ISS! Outside the museum, there is even more fun to be had! As I rounded the corner of the museum, I saw what I thought was the vertical stabilizer of a space shuttle. As the full body of the spacecraft came into view, I realized it was a test model of the Buran – a Soviet orbital vehicle that made one unmanned spaceflight in 1988. The Buran has a staircase going up to the side and a model satellite inside its payload area. You can also climb a ladder up into the cockpit and try out the pilot’s seat. 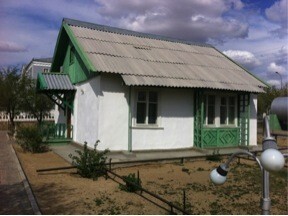 Immediately adjacent to the Baikonur Cosmodrome Museum are the cottages of Yuri Gagarin (and other early cosmonauts) and Sergei Korolev (the lead Soviet rocket engineer and spacecraft designer during the Space Race). They have the inside of the cottages staged to look as they did during their time of use. Walking around outside the museum you can also find a monument to Yuri Gagarin and some more spacecraft models. In addition to touring the Baikonur Cosmodrome Museum, I also had the opportunity to tour one of the Soyuz launch complexes, including the assembly building and the launch pad. It was a rare rainy day in Baikonur for my tour, but I braved the cold, wind-driven rain for a chance to see where a Soyuz is launched – it was worth it! The truss structure that supports the rocket prior to launch is impressive! Driving around the town of Baikonur, its difficult to get too far before finding another monument or piece of artwork dedicated to the many achievements in space exploration that occurred there. 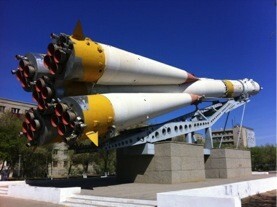 My two favorites were the full-scale Soyuz rocket and the Yuri Gagarin sculpture. After witnessing a Soyuz launch, it was a treat to get to walk right up to (and under) a model of the rocket. The Yuri Gagarin monument is a must-see. 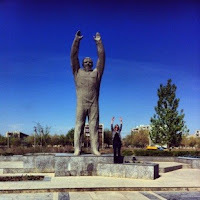 You HAVE to get a picture of you posing Gagarin-style next to him. All of the well-known sights in Baikonur are as amazing (if not more) as I thought they would be. What I did not anticipate were the lesser-known treasures sprinkled around the Cosmodrome that I just happened to stumble across. 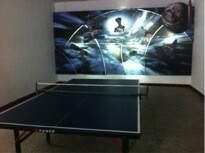 For example, while touring the Soyuz assembly building at one of the launch complexes, I discovered the coolest Ping-Pong room EVER. 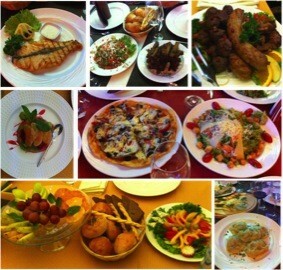 The food in Russia and Kazakhstan is an experience all in itself. 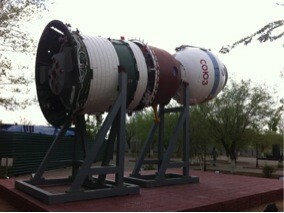 In Baikonur, we ate all our meals at the hotel. Lunch typically consisted of 3 courses: salad, soup, and a meat dish. My favorite soup was the borsch, which is a beet-based soup. Dinner was typically also 3 courses. It started with appetizers including fruit, vegetables (usually cucumbers, tomatoes and peppers) and mixed meats and cheeses. Following that, we usually had a fish course and a meat course. One of my favorite dishes was manti, which is a dumpling filled with a spiced meat mixture and served with different types of sauce. The Baikonur market is not to be missed. It’s partially outdoor under tents and the rest is in an open-air covered structure. They have tourist souvenirs, spices, fruits and vegetables, and even camel hair products! 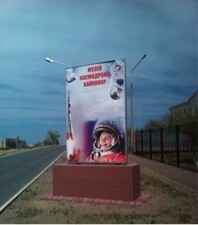 Baikonur is a meaningful destination for space enthusiast. Getting to see a Soyuz launch first-hand was an exhilarating experience and getting to walk the same steps as so many space explorers was something I will never forget. I feel privileged to have gotten the chance to set foot in this place and experience even just a small piece of it. Meet Kelley Alwood – She is an aerospace engineer who dreams of one day going into space. Kelley grew up in Alexandria, VA and currently lives in Mountain View, CA. She received a B.S. in Aerospace Engineering from Embry-Riddle Aeronautical University in Daytona Beach, FL and two M.S. degrees form Stanford University; one in Aeronautics & Astronautics and the other in Management Science & Engineering. As a Mechanical Engineer at NASA JPL, she worked on both the Mars Science Lab (MSL) andJuno spacecraft. Kelley currently works at Skybox Imaging as a satellite project manager. Outside of work, Kelley is involved in Girl Scouts and also enjoys travelling, cooking, yoga, and genealogy. She has her private pilot’s license. Today I’m excited to share a guest blog post from Kelley Alwood. 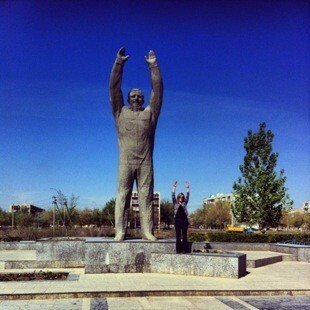 I met Kelly on Twitter and I’ve so appreciated her continued support – she’s even joined my #SoyuzAdventure crew. And now she’s agreed to write this post after just returning from a launch in Baikinor. I’m so excited to share this with you – enjoy!